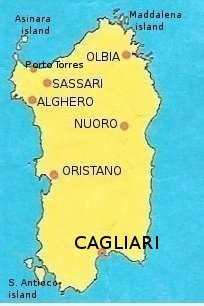 Sardinia is one of the easiest places in Italy to find examples of rituals and costumes that pre-date Christianity, especially in the “zoomorphic” masks that appear in festivals throughout the island, particularly in the inland areas of Nuoro and Barbagia. For example, the photo (right) is a mask of su boe di Ottana [the bull of Ottana, a town of about 2,000 near Nuoro]. 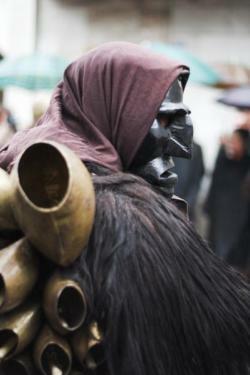 The figure appears at carnevale and the ritual involves the yoking of an ox and the blending of man and beast into a single figure. 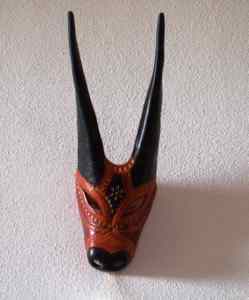 The presence of and importance given to the ox is ancient and widespread in Europe. Also near Nuoro is the town of Mamoiada, where the character of Mamuthone reenacts rites of propitiation to the ancient gods of agriculture. The mask (photo, left) is carved in pieces of wild pear wood, alder and walnut and darkened to give it the traditional look —diabolical and savage; he is, says tradition, a union of fire and the moon. The mask has become iconic of rural Sardinia. The ritual involves an orderly procession/dance, and one important aspect of these rituals, not just in Mamoiada but elsewhere throughout the rugged interior of the island, is that they have resisted attempts to abolish them throughout the centuries by one or another colonizing force. The idea that there were bands of rugged farmers quite capable of joining together to sacrifice animals (and maybe invaders) did not sit well, say, with the Romans or even many centuries later with the Spanish, both of whom were content to colonize the coasts and stay away from the inland mountains. The town of Mamoiada is now home to an important Museum of Mediterranean Masks.